"Just as continuing revelation enlarges and illuminates the scriptures, so also a study of the scriptures enables men and women to receive revelations. 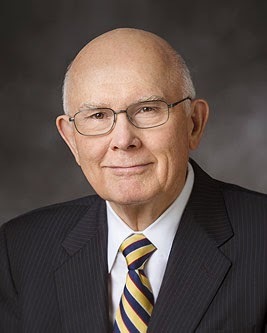 Elder Bruce R. McConkie said, 'I sometimes think that one of the best-kept secrets of the kingdom is that the scriptures open the door to the receipt of revelation' (Doctrines of the Restoration, ed. Mark L. McConkie, Salt Lake City: Bookcraft, 1989, p. 243). This happens because scripture reading puts us in tune with the Spirit of the Lord. "The idea that scripture reading can lead to inspiration and revelation opens the door to the truth that a scripture is not limited to what it meant when it was written but may also include what that scripture means to a reader today. Even more, scripture reading may also lead to current revelation on whatever else the Lord wishes to communicate to the reader at that time. We do not overstate the point when we say that the scriptures can be a Urim and Thummim to assist each of us to receive personal revelation. "Because we believe that scripture reading can help us receive revelation, we are encouraged to read the scriptures again and again. By this means, we obtain access to what our Heavenly Father would have us know and do in our personal lives today. 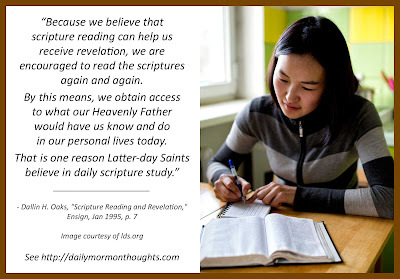 That is one reason Latter-day Saints believe in daily scripture study." Elder Oaks describes an interesting inter-relationship: revelation enhances understanding of the scriptures, and scripture study enhances our ability to receive revelation. Reading the scriptures "puts us in tune with the Spirit of the Lord." And through that Spirit, we discover new meaning and application to the words of the past as we are open and prepared for new personal revelation. It's a relatively simple formula with a marvelous promised reward! Since we have daily needs for divine help and inspiration, we should have a desire for the daily scripture study that can invite the blessings we seek.